Note: Names were assigned to active submarines in 1944. A planned run of six boats. Officially reported as 450 t boats, the class is somewhat larger than the preceeding I-2 and I-9 classes on account of a greater operating radius, larger powerplant, and heavier armament. Though technically coastal boats, there is an expectation that the class should be able to operate in the eastern Indian Ocean and the western Pacific, allowing the larger I-6 and I-11 classes to focus on the more distal western Indian Ocean. The I-21 class is a variation of the I-15 class; it includes a "shed" that can store two humasteered torpedoes or small boats, as well as bunk space for a squad of AOWWT (Atypical Operations, Weapons, and Warfare Team) naval infantry. This approach to inserting raiders will be evaluated in light of India's mixed success using destroyers and MTBs during the Filipino revolution. Such forces could be used for attacking warships in port, sabotage of enemy facilities, reconnaissance, and other missions. The I-22 class submarine has been planned for a while now: boats using vertical-tube launched mines to lay small minefields in enemy waters. Four tubes, each housing four mines, are located aft of the conning tower for this purpose. Two units will be laid down in 1930, with an eye towards another four to six similar boats if the initial class is deemed acceptable. Incremental improvements on the I-11 class of 1927. The largest submarine laid down by India so far, the I-28 is an ocean-going minelayer. I-28 and her planned sister will round out India's Class A submarine roster. Indian copy of Ninjatousaya System fitted. 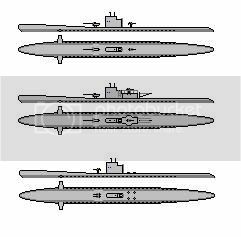 The I-31 submarine were build concurrently with the I-30 and all four subs rounded up the Ocean Going submarines roster allowed by the Karachi Agreement and the Australian Naval Agreement. The I-34 has a longer, slimmer hull form than the preceding I-31 type, allowing for a greater speed on surface. Greater ballast is also provided for, and the boat is more stable. On the other hand, two fewer tubes are carried aft, and maximum diving depth is reduced. The Durjeya class submarines are new ocean-going boats with substantially improved machinery and battery capacity, enabling longer and faster time spent underway. In conjunction with the Ninjatousaya, this should allow the boat to minimize time spent on the surface. Armament has been revised somewhat over the previous Prakopa class, with the stern tubes and the major calibre gun being discarded. The latter is omitted in part for streamlining but also because the BNS is less concerned with conducting "Cruiser rules" trade warfare and more interested in hunting surface warships. Whether this proves to be a reasonable expectation remains to be seen. A total of twelve boats are planned in 1945 and 1946, with the expectation that the six Satarka and Parangata class boats will be removed from active service at that time.